I like yor picture, it shows the new beginning in spring. Love the texture! And I love how much it has smelled like spring around here! I can handle spells of winter weather, as long as in between I can get outside. Lovely texture. Here there are signs as well, but tomorrow winter returns. Thank you for hosting and have a great week. beautiful...you've got the buds, I've got the blooms this week! i worked in the gardens for several hours yesterday....i saw a lot of this!!! your image is beautiful!!!! Lovely to see the buds, spring will be here soon. The buds look like a little foot! Your photo is beautiful ! Sorry . . . my backlink will not be accepted. Getting those signs at my house too! So ready for spring! It looks like spring is getting ready to spring into action. Beautiful! 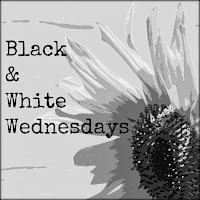 I really need to get organized and come join you for B&W Wednesday.